Rousseff’s problems are legion. The most pressing is a large bribery scandal at Petrobras, the state-owned oil company, which keeps engulfing more and more people. But it’s worth bearing in mind that Brazil—a newly democratic state and one where government and business are deeply intertwined, even in industries that aren’t explicitly nationalized—regularly has major scandals. The previous all-encompassing bribery scandal, ten years ago, in which it was revealed that many congressmen had accepted payments for their votes, is the reason Rousseff is President. The two senior figures in her party, Antônio Palocci and José Dirceu, were both implicated in the scandal; President Lula da Silva turned to Rousseff, his chief of staff and an accomplished technocrat, to lead the party and run in the Presidential election of 2010. It was Rousseff’s first campaign for political office. Lula had the good fortune to preside, from 2003 to 2011, over boom times in the Brazilian economy. His program was aggressively selling Brazil’s bounty on the global commodity markets and putting significant government transfer payments in the pockets of Brazil’s poor millions, while maintaining enough fiscal and monetary discipline to keep inflation down. By whatever admixture of luck and skill, it worked. Lula had an approval rating of over eighty per cent when he retired, which made him probably the most popular head of state in the world. Rousseff was elected, in 2010, and reëlected, in 2014, by modest margins, and, especially since her reëlection, things haven’t gone so well for Brazil. Commodity prices are down, inflation is returning, and the country’s enormous and relatively new class of people who no longer are desperately poor is simultaneously experiencing rising expectations and diminished prosperity. There is a lesson about politics here. Although it’s inconceivable that someone like Rousseff—who, like many of her colleagues in government, participated in the militant resistance against the former military dictatorship and spent years in prison—could be elected to office in the United States, she seems like the kind of person one wants in office. She is brilliant, forceful, hardworking, detail-oriented, trained in economics, and, from what we know thus far, personally honest. Lula has a fourth-grade education and governed from the gut rather than from the facts. Rousseff, tall and commanding, is a workaholic whose aides know that she might call them at any hour to go over some policy detail. Lula, short and plain, operated on an unpredictable schedule, liked to have fun, and would rather hug than hector. Like Rousseff, Lula served time in prison during the country’s years of military dictatorship, but he was willing to regard the unpleasant past, and his former enemies in politics and business, with an accepting shrug. 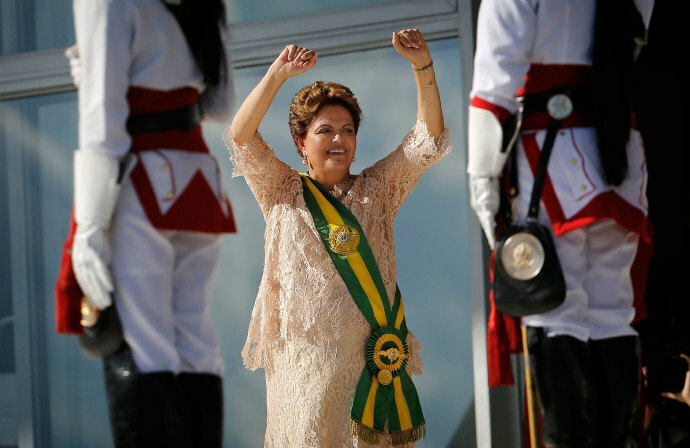 Rousseff started a Truth and Reconciliation Commission. Rousseff, who in her youth was a fan of the French barricades intellectual Régis Debray, has an obviously hard time embracing capitalism. Lula, whose background is less intellectual but no less left-wing, seems to be for whatever works. Rousseff’s unpopularity in Brazil has brought millions of demonstrators into the streets and set an impeachment campaign into motion, but the greatest political peril probably isn’t to her personally—she isn’t allowed to run for another term anyway—but to the long-term health of the Partido dos Trabalhadores (P.T. ), the workers party that Lula helped found in the nineteen-seventies and that Rousseff abandoned a more revolutionary party to join. With three years to go until the next Presidential election, it seems likely that Brazil’s private business interests will try hard to put together a rival political coalition that will argue that it can deliver a better economy and a cleaner government than the P.T. Early in her term, Rousseff played to Brazilian public opinion by frequently criticizing the United States; it says something about her current position that being feted by the U.S. looks to her like a popularity-boosting move. It’s also unlikely that Brazil can be cleaned up to anything like an American or Western European standard during the first term or two of any new government. The myriad political parties, the dozens of cabinet departments, the very large and powerful state governments—all are part of a system in which there is far more regular and deep economic and political exchange between the state and the market than the term “bribery scandal” can capture. It would take at least a generation for Brazil to exit from that system, even if the will were there. In the meantime, as is true in most places, things may well get better when power is back in the hands of someone who operates from instinct and emotion—a sculptor whose clay is other people—rather than someone who thinks, analyzes, plans, and gives orders.